Cherokee Memorial Park is your cemetery. We encourage you to visit on a regular basis. Please remember those buried next to your loved ones are your neighbors. Be respectful, follow the the rules in the brochure “Caring for Your Gravesite” and “Gravesite Guidelines”. For an online version you may click here or stop by the office for your updated paper version today. We strive to create and maintain a beautiful Cemetery where you can find comfort when visiting your loved ones. To maintain this beauty, we encourage you to read the brochure “Caring for Your Gravesite” it will help you understand your part in maintaining the cemetery. This brochure is updated annually. Copies can be obtained in the Cemetery office, Vineyard Chapel or you can download a pdf copy here. Some people are more visual in their understanding of the policies we have put in place. For you, we have created a brochure “Gravesite Guidelines”. With the use of pictures some may find it helpful in understanding their part in maintaining the Cemetery. 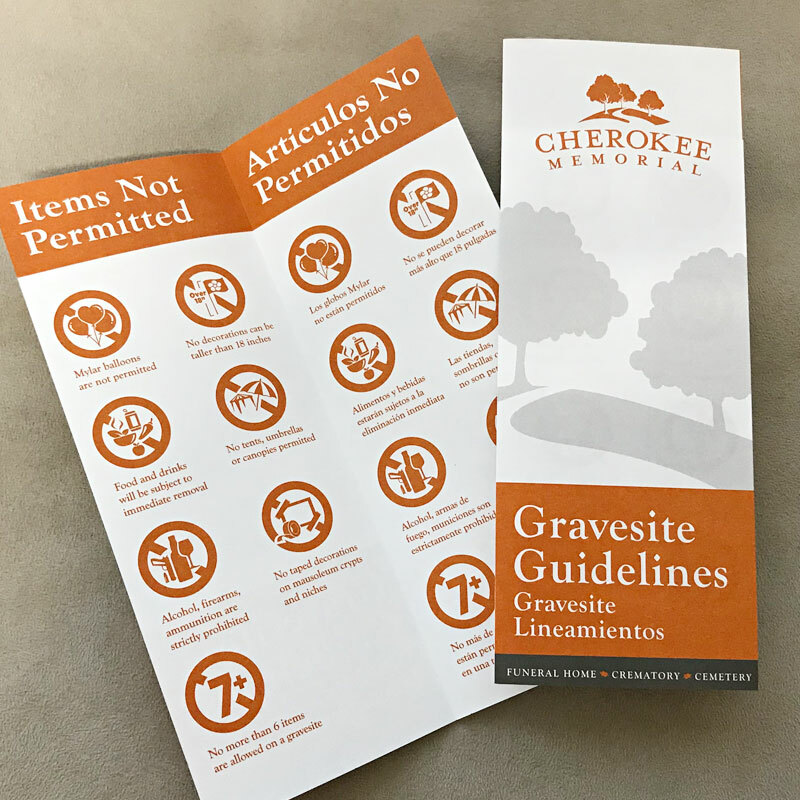 This brochure is printed in English and Spanish and is in the office, Vineyard Chapel or can be downloaded as a pdf here..
Cherokee Memorial wants you to be safe during your visit. Although we think these are sacred grounds, please be aware of your surroundings, lock your valuables (purses, backpacks, brief cases, cell phones, etc.) out of site or keep them with you. Don’t decorate your gravesite with sentimental items, they may not be there upon your return.